Longacre Computerscales Hybrid DX2 72613Use just like traditional wired scales - OR - you can remove the controller tablet and use it wireless. Large high resolution 6" x 3.75" backlit color display. Many of the app features of our wireless tablet scales - in a hybrid wired / wireless system. Includes 15" x 15" scale pads - 1500 lb per pad cap. 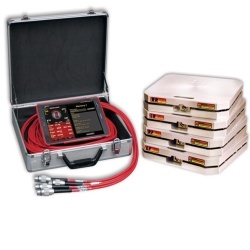 Longacre Gas Can Weigher Scale 72330Weigh gas can during a pit stop to determine fuel mileage. Can be used for various other weighing jobs too. Reads to 1/10 lb. 12" x 12" platform Battery powered 350 lb capacity. Longacre Legends Car ComputerScales 72582Longacre ComputerScales 72582 is a great choice for Legends car racers, as well as IMCA, road racing formula classes and more. The system includes four 12"x12" 1100 lb. capacity pads and a digital control indicator. Simple to use - just push 2 buttons to get everything you need! Push one button for all 4 wheel weights. Push a second button for all partial %. Longacre AccuSet II Karting Computer Scales 72624The Longacre AccuSet II Karting Computer Scales are simple to use. System features (4) 12" CNC machined kart pads w/ 400 lb capacity. Each pad has extra rigid design for greater accuracy and consistency. The display features a NEW - Large 4 line display shows all 4 wheels and ALL partial %. Easy to use system -- just set them up and turn them on. 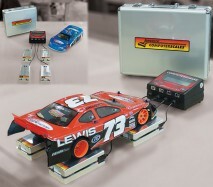 Longacre Racing Computerscales AccuSet II RC Car 79985RC Scales from Longacre Racing are here. Getting your chassis setup correctly and accurately will make a huge difference in handling and give you more wins and better finishes. CNC Machined Billet Aluminum Pads - 14 lb. 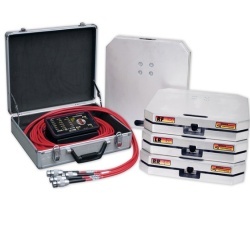 capacity per pad - Set of 4 - 3.0" x 5.5". Read wheel weights in 1/100 lb., 1/10 oz. or grams - Easy to switch. Large 4 line display shows all 4 wheels. Many of you know that scaling your race car is probably one the most important practices that you can do to increase your chance of winning. Proper chassis set up requires that the weight balance is set correctly for the car, driver and the race track you are competing on. 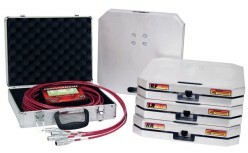 In order to achieve proper and repeatable weight balance on a consistent basis, a quality set of Longacre Racing Computer Scales will need to be purchased. You may be asking, how level do the scales really need to be? 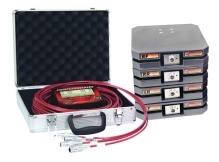 For optimum results the closer to exact the better when it comes to level. You need to maintain scale pads within the same plane. Raising one corner or opposing corners is going to effect your readings. In general, it is best to keep the scales as level as possible.